Today, the conversation about smart cities has developed a new mindset for individuals within urban areas. More than ever, citizens are concerned about technology advances, yet optimistic for opportunity, and cautious with data privacy, yet demand personalization and convenience. In some cities, citizens have mistakenly been significantly left out of the smart city conversation, causing exponential concerns and questions which only backfires on the city leaders. Incorporating a bottoms-up design thinking approach to smart cities has never been more important. Allowing citizens to be the innovators for their own community has a multitude of benefits. When citizens get involved early (and everyone is a citizen, by the way), they can be the explorers and ideators for designing problem-focused solutions to help create efficient smart city innovation-driven initiatives. 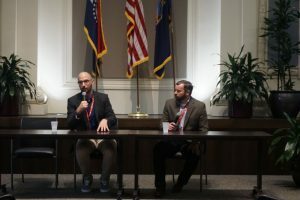 On October 8, 2018, Think Big partnered with Techweek KC to host a Smart City Citizen Innovation Workshop. 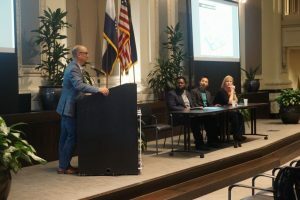 This interactive, design thinking workshop was an opportunity for attendees to learn about the basics of design thinking and how we can apply it to Kansas City. 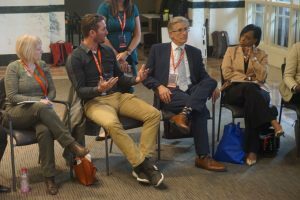 Throughout the day, Think Big took attendees through a series of exercises that allowed them to understand the design thinking process, some smart city possibilities, then join in on a well-rounded explorer and ideator conversation in small groups. Herb Sih and the moderators kickoff the smart city workshop. 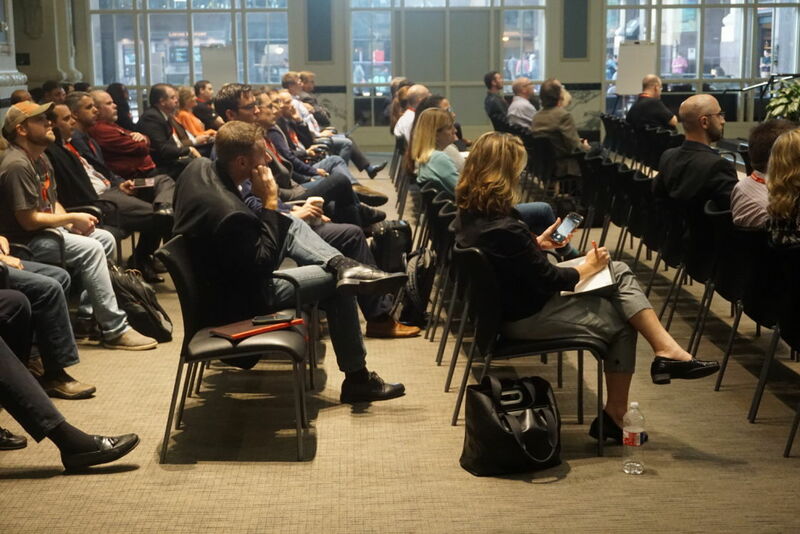 The smart city citizen innovation workshop was held at Union Station. Scott Ingvoldstad of Panasonic CityNOW addresses the audience. Adam Tank of SUEZ and Bob Bowman of Husch Blackwell talk smart cities. A group of citizens meet in small groups to discuss smart city in KC. Prior to the event, Think Big reached out to 85+ different organizations and groups throughout the Kansas City area such as citizens/citizen groups, regional entrepreneurs, innovators, technology and infrastructure companies, city officials, homeless shelters, social service organizations, Chambers of Commerce, minority groups, local entrepreneur support organizations, local media outlets, colleges and many more. Prior to the event we had 100+ sign ups and as many public events go, we had 55-60 individuals attend throughout the day. 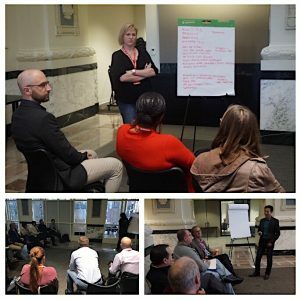 While it wasn’t as diverse as one might hope, the group that came, discussed their greatest challenges and thought of new ways that the city might help face those challenges through smart city-centric design thinking exercises, adding value to the existing smart city discussion. During our Smart City Citizen Innovation Workshop, we opened up a conversation about how design thinking is a way to implement a more efficient, responsive, and sustainable city. The Explorer design thinking process is to identify/discover and define emerging and existing problems, such as communities for all ages, digital divide, education, energy, environment, government, jobs, public safety, etc. While the Ideator design thinking process is the ability to conceptualize novel solutions to well-defined problems. Three small groups of citizens met to discuss education and digital divide. 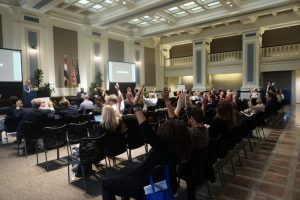 After the presentation about design thinking and smart cities, attendees voted on subject matters that they viewed as important to discuss as a component of smart city in KC. The top two subjects selected were “education” and “digital divide”. The attendees broke into three groups and each went through the Explorer and Ideator design thinking process for both subjects. A sample of the raw notes from the citizen group discussions. Each group discussed challenges and solutions for improving education and decreasing digital divide. 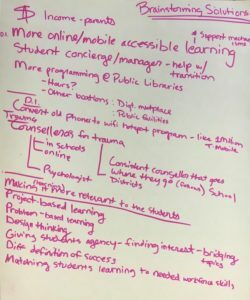 Since the raw notes from the breakout sessions can be valuable to understanding how each group’s design thinking process went and provide additional insight, we’ve posted them publicly. 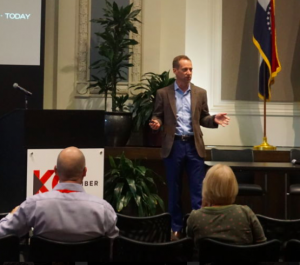 Thank you to all attendees and speakers who contributed to our Smart City Citizen Innovation Workshop at Techweek KC. Your impact is valuable to creating efficient smart city innovation-driven initiatives. Think Big has done numerous citizen engagement activities in a variety of ways in the last decade. More specifically, in the smart city space, we find that city leaders are asking for this more and more as the citizen voice becomes more prominent. It’s no secret that quality citizen engagement is not easy and there are ways to not do it. 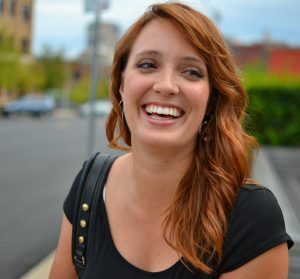 Think Big can help your city host a citizen engagement workshop to meet your goals. This Techweek KC model is just an example of what we can do. 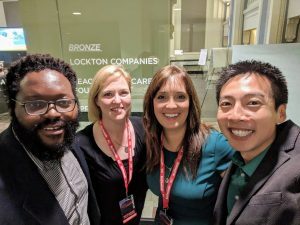 If you’re interested in learning more about what Think Big can do, please contact us on our website, by emailing smartcity@thinkbigpartners.com or calling +1 (816) 842-5244. We look forward to hearing from you!